Summertime means fresh melon abounds. 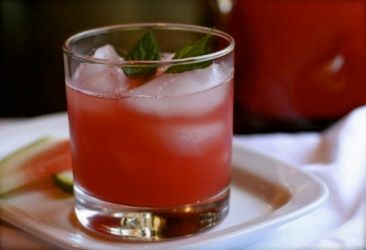 One of my favorite things to drink is watermelon juice, though honeydew, cantaloupe and other melons also make a great sweet but refreshing summer beverage. One large melon or two to three small. Color – Look for a melon that is dull, not shiny, dark not light and one that has a field spot. This is the place where the watermelon laid on the ground, it should be creamy, not white, but white is better than none at all. Shape – Find a melon that is uniform in shape. This shows that it had adequate supply of water and nutrients. Sound – Holding the melon away from your body, give it a rap with your knuckles. It should sound more like a tenor than a bass. A low bass sound can mean it has split inside and there might be empty space, a condition known by farmer’s as ‘hollow heart’. Bee sting – Look at where the stem was cut from the melon. The best melons may have a drop of what looks like sap or hardened honey, a sign of abundant sugar content. Once you’ve chosen your melon, chop into chunks, puree in a food processor and press the juice through a sieve to remove the pulp or use a juicer if you have one. You’ll be left with just the sweet, refreshing juice. Shake this with ice and top with soda water. Other delicious additions are muddled mint, slices of lemon cucumber (or even the juice of lemon cucumbers), a squeeze of lemon or lime or an addition of any other seasonal juice like peaches or plums. A splash of gin or vodka can also be a delicious addition for making some adult beverages. Just remember to shake well with plenty of ice to chill thoroughly before serving.